Dive into our Security Manifesto! Cloud-A’s infrastructure has been architected to be one of the most flexible and secure cloud computing environments available today. In addition to Canadian data resident Cloud, we provide an extremely scalable, highly reliable platform that enables customers to deploy applications and data quickly and securely. With Cloud-A, not only are infrastructure headaches removed, but so are many of the security issues that come with them. Our highly secure Canadian data centres utilize state-of-the art electronic surveillance and multi-factor access control systems. Environmental systems are designed to minimize the impact of disruptions to operations. And multiple geographic regions and Availability Zones allow you to remain resilient in the face of most failure modes, including natural disasters or system failures. The Cloud-A virtual infrastructure has been designed to provide optimum availability while ensuring complete customer privacy and segregation compliant with standards including PCI-DSS & SSAE 16 TYPE II . Customer access points, also called API endpoints, allow secure HTTP access (HTTPS) so that you can establish secure communication sessions with your Cloud-A services using SSL/TLS. You can control how accessible your instances are by configuring built-in firewall rules – from totally public to completely private, or somewhere in between. And when your instances reside within a Virtual Private Cloud (VPC) network, you can control egress as well as ingress. The Cloud-A Virtual Private Cloud (VPC) service allows you to add another layer of network security to your instances by creating private subnets and even adding an IPsec VPN tunnel between your home network and your Cloud A VPC. For customers who use encryption extensively and require strict control of their keys, we offer a convenient management option for creating and administering the keys used to encrypt your data, or access your servers. 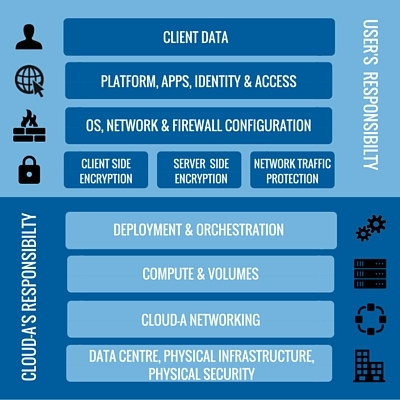 Because you’re building systems on top of Cloud-A infrastructure, the security responsibilities is shared: Cloud-A has secured the underlying infrastructure and you must secure anything you put on the infrastructure or connect to the infrastructure. The amount of security configuration work you have to do varies depending on how sensitive your data is and which services you select. For IaaS services like Cloud-A compute instances and Swift bulk object storage, you have more control and therefore more configuration work to do. For compute instances, you’re responsible for patching the guest OS on the instances as well as any software you install on them, configuring the security group (firewall) that allows outside access to your instances, and setting up any VPC subnets that the instances reside within, etc. For Swift bulk object storage, you must set the access control policies for each of your storage buckets, set up encryption options for the stored data, and specify backup and archiving preferences. We know that it’s important for you to understand the protection measures that are used to guard the Cloud-A infrastructure. But since you can’t physically touch the servers or walk through the data centres, how can you be sure that the right security controls are in place? The Cloud-A security team encourages customer communication.